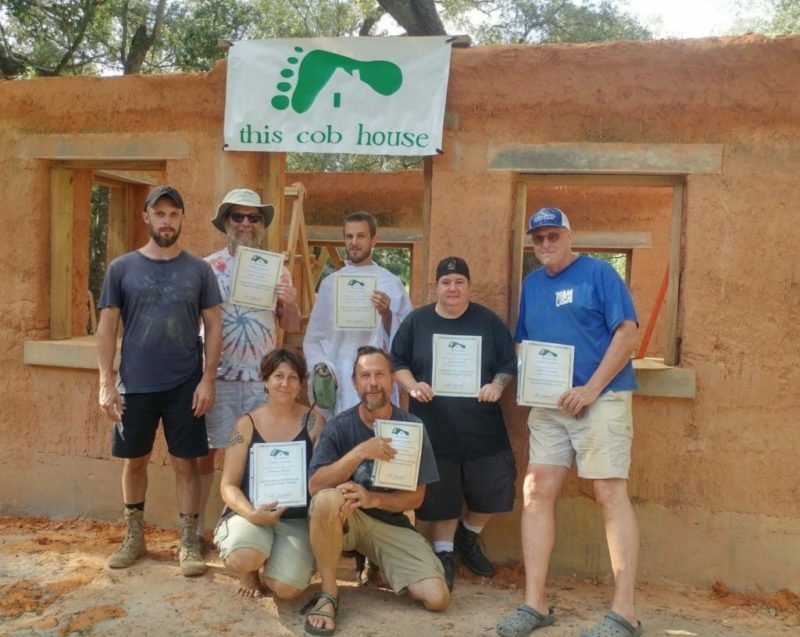 In this course, we’ll work on finishing an existing straw-bale and cob hybrid building. Students will gain a thorough understanding of building with earth in various forms. 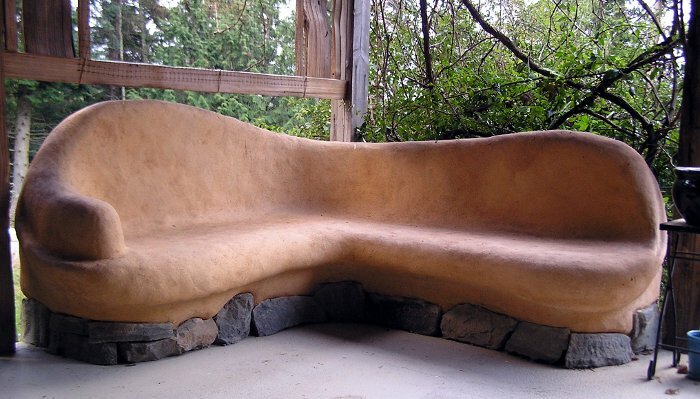 Including building cob walls, earthen floors, making and applying earth plaster finishes. In addition we will learn about green roofs by installing the drainage and soil layers of our building’s roof. Our days will be spent engaged in hands-on building and learning with natural materials. Expect a rich week of natural and community building with the group. We’ll work, learn, eat,and relax with each other in a positive, hard-working, fun atmosphere. Conversation on natural building will provide constant background chatter throughout the week. We’ll work on site every day with a scheduled mid week rest. Evening are typically unscheduled so folks have time to enjoy the site, explore quaint nearby towns, or relax around the fire. Depending on interest, we will schedule discussions and/or presentations on topics such as foundations, wood framing, permitting and codes, fine finishes for after dinner. Our site is Heart Song Sanctuary, a beautiful 45 acre property with two completely finished natural buildings. The site featuring many acres of woods, a cleared meadow, swimming creek and pond. Accommodations for camping include an outdoor shower, compost toilet outhouse, and fire pit/gathering area. vegan option. Many of the ingredients will be sourced from local farms. Please indicate any food allergies upon registration. Work on site will begin following breakfast the morning of the date listed. Participants are encouraged to arrive the preceding afternoon/evening to set up camp, and commence the week with an informal dinner and visiting with the team around the fire. Michael McDonough will lead the workshop. He has been working as a natural builder since his 2008 apprenticeship with Ianto Evans at the Cob Cottage Company. 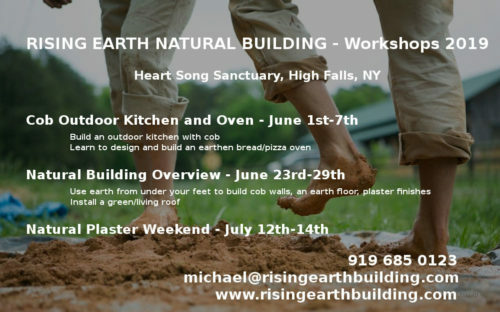 He has taught 15 natural building workshops and has worked with a number of natural building leaders including Clark Sanders, Thea Alvin, and Greg Allen. 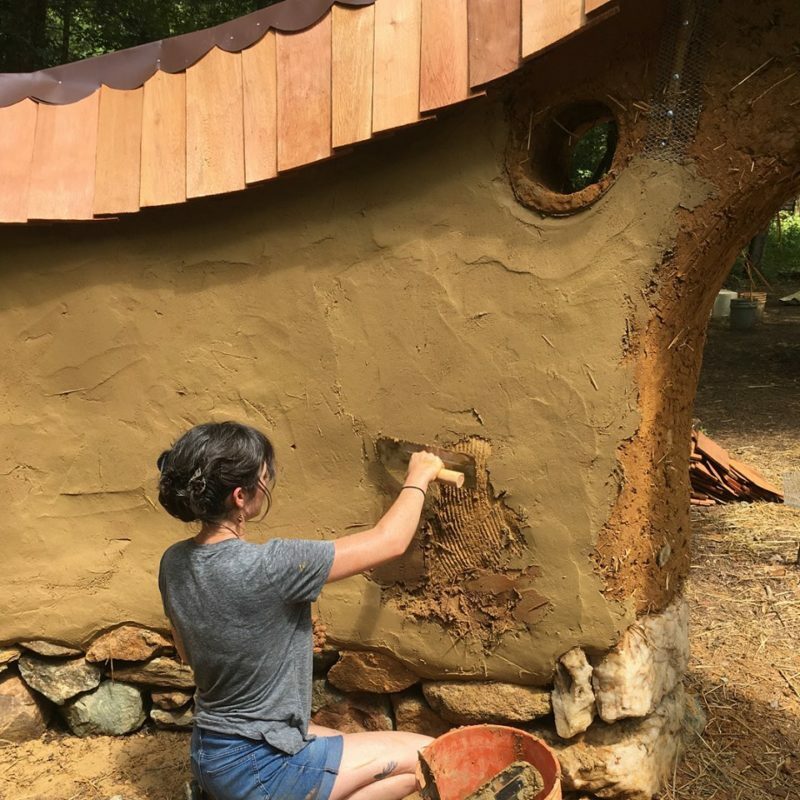 His work can be found at a number of happy homesteads on the east coast, The NC Museum of Life and Science, Bonnaroo Music and Arts Festival, Oxmoor Farm in Louisville, KY.
* Camping equipment including tent, sleeping bag, flashlight. * Tool kit including tool belt, knife, tape measure, pencil, hammer. * Notebook, building plans or sketches to discuss. Tuition includes a week of camping, workshop experience, meals. Group rates, and discounts for previous students, or taking multiple courses are possible.